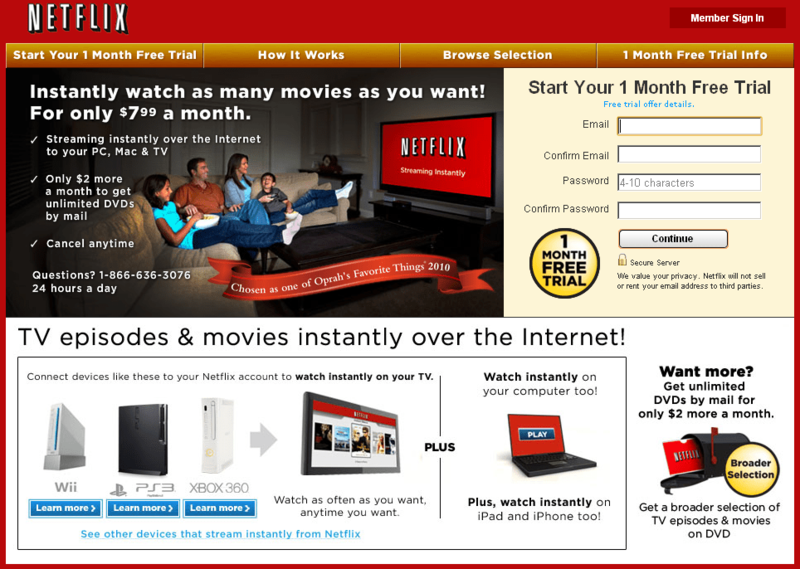 Update July 2011: Netflix has increased the price again and split DVDs from Instant Streaming. Read more. A little over a month ago, I snapped some screenshots of the Netflix website that revealed a price change was coming. An Instant Streaming-only plan would be offered at $7.99 and the cheapest price to get a DVD by mail would be $2 more, or $9.99 per month. Today, Netflix has officially announced that those changes are now in place and available for switching over. The changes will be a little more permanent this time. From the comments on the Netflix announcement, it seems Netflix might lose a few customers with this price increase. At the very least, most people don’t seem too happy about the increase. Much of the anger comes from the different increases in price for different plans. 1 and 2 DVDs out at a time, increases by $1 but 3 DVDs increases by $3 and 4 DVDs increases by $4, and it continues to increase by a dollar per DVD per month from there. If you like the sound of a streaming-only plan, you can change your subscription under the Your Account page. You’ll see the new plan pricing and a warning that your current plan is no longer available. If you switch, you won’t be able to switch back to the current pricing. I was confused that current customers might possibly be grandfathered in and would be able to keep the current pricing until they changed plans. Unfortunately, that’s not true. Plan increases will go into effect January 2nd, 2011 unless you switch plans earlier. To see how you can expect the increase to affect your subscription, you can see the Membership Details. It reveals some information that I couldn’t find elsewhere regarding the Blu-ray surcharge. The extra $2/month will remain and at the same cost. This seems to be terrible timing in my opinion. Right before holiday shopping begins, this might deter some folks away from Netflix Gift Subscriptions. Between the price increase, the Blu-ray surcharge, and a stalled queue (Long wait and short wait on any movies I really want to see and more DVDs in my Saved queue than in the DVD queue), I’m considering dropping Netflix at this point. I don’t think anybody ever wants a price increase, but what are your thoughts on it? Will you switch to the streaming-only plan? Will you be decreasing the number of DVDs out at a time? Will you drop Netflix altogether? Are you scoping out redbox or Hulu Plus for alternatives?